Aileen and Nick warmly welcome you to Galvelbeg House, a high quality family run guesthouse offering Bed and Breakfast or self-catering accommodation in Crieff, Scotland. Situated on the east side of Crieff on the main Perth Road, the house enjoys uninterrupted views of the Ochil Hills and Strathearn Valley. The town centre is only a few minutes’ walk away, with an interesting selection of shops, cafes, pubs and restaurants. If you want to take in more of Perthshire's glorious scenery then take to the open road, where the winding roads take in hills, pretty villages, lochs and rivers. Free Wi-Fi. Drying room and Motorcycle washing facilities, on request. Private parking. heart of Perth, to the town center, where there are many restaurants, cafes and bars, as well as the Perth Theatre, Concert Hall, Perth Museum and Art Gallery. Also very close to Scone Palace and the Perth Bridge (as pictured) known as Smeaton's Bridge, the Old Bridge and in the local dialect of Scots, "the Auld Brig". Situated on A94, within a ten minute walk of Perth City Centre and local attractions including the Scone Palace, Perth Concert Hall, Theatre, Museums, along with various places to eat, drink and be merry! 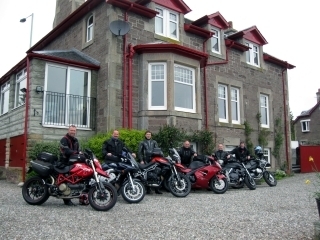 famous Gleneagles and St Andrews golf courses, distilleries, castles, lochs & glens.